Wikipedia lists Dragon 2 pressurized volume at 10 cubic meters while the Apollo CSM is listed at 10.4 cubic meters pressurized. The Wikipedia page I'm looking at for the Apollo Command/Service Module lists the internal volume as 6.2 cubic meters. For Orion Wikipedia lists the habitable pressurized volumes as 8.95 cubic meters. If we were only looking at habitable volume it would appear that Dragon Crew has the larger internal area of the three vehicles. However all of these capsules are really just meant for basic transportation. In fact I would argue that for any capsule the farther is gets from Earth orbit the less efficient the design becomes, because their core competency is returning safely to Earth through Earth's atmosphere - every other function they may be pressed into doing in space can be done far better by space-only elements. The propulsion system of Dragon v2 wouldn't be very good at efficient insertion into NRHO because the efficient trajectories include powered lunar flybys. The draco thruster has 2 orders of magnitude less thrust than then the OMS engine on Orion and the super-draco thrusters have poor vacuum isp and off axial thrust. All of this can be fixed by beefing up the trunk into a service module for dragon v2. But it is no where near ready to go as it was designed for LEO crew transportation. Except for the lunar fly-by, I think SpaceX is assuming it will be leaving LEO in some version of an ITS, not a Dragon, so I think we can ignore Dragon what-if's. Big picture though, if we are only thinking about having four people in space at a time, then sure, Orion can be a capable vehicle for cislunar operations. Not the most comfortable ride, but those going would put up with such discomforts for the chance to do what few have done in space. But I would hope we are setting our sights at having more than four people in space at any one time, which is one of my touchstones for critiques of any HSF hardware. Does it allow & promote the expansion of humanity out into space? With expansion in this case not meaning distance, but the number of people. And because adding people to space means money, we either have to get a bigger pot of money (not likely to happen for NASA), or we have to somehow reduce the cost for doing anything in space. And it is from the perspective of cost that I have the most objection to the SLS & Orion, because I see them as slowing down our expansion out into space, not accelerating it. Coastal is right about capsules(/reentry vehicles) not being ideal for BLEO travel. A OTV with attached habitat module would be better and far more flexible. But require fuel depots and in orbit refuelling, as BLEO -LEO DV is same as LEO-BLEO. Sorry for the tangent I've sent this thread on Chris! Summary: Crew on EM-1 would have accelerated NASA exploration. Unfortunately, they weren't sure the heat shield would work. Also, money. This is the first I've heard on the heat shield, I know they wanted to redesign for lowered cost. Anyone that can summarize why the heat shield wouldn't be up to the task? New design. Heatshield is now made out of multiple blocks in stead of being monolithic. A modular Avcoat heatshield has never been tested before. Disagree. It only takes 3 days to reach lunar orbit or back. That compares to a couple days to launch or return from ISS, and up to 2 weeks for Shuttle missions. Cislunar transport doesn't need extra space than is needed for typical LEO capsule missions. A separate cislunar transport craft (in addition to a capsule and a lander) doesn't make sense to me. Just another development project to amortize and another docking event. Orion (or any other capsule) is fine. I don't understand this pure fantasy. We have not in anyway proven how to live and survive in deep space without the aid of earth. Until that is well known and proven, you can't start building spacecraft for 100s of people, its just too risky. You are acting like we're on the verge of Star Trek technology or something. I don't understand this pure fantasy. You think having more than four people in space is pure fantasy? We have not in anyway proven how to live and survive in deep space without the aid of earth. I don't understand what you are responding to. Where did I make such a claim? Until that is well known and proven, you can't start building spacecraft for 100s of people, its just too risky. Again, where did I make such a claim? I guess you don't keep up with what NASA thinks is a near-term possibility? If the ISS has shown us anything is that we can occupy space with more than four humans at a time, and I advocate that our goal should be to start focusing on expanding that number - I don't care what the rate is, as long as the numbers go up and not down. I never said it wouldn't work. But it depends on what the goals are whether it fits the needs. If you're going to limit the passengers to people that have been highly trained, then sure, they can put up with each other for those few days. But that assumes we're not expanding the number of humans in space. Depends on how many people are going to be in transit. If there will only be four people per year, then no, you don't need anything else. But if you are going to be having a constant stream of people going out to a DSG, and then down to the Moon and/or on to other destinations, then pretty soon a four person disposable capsule starts becoming a limitation, not an asset. So it depends on what the goals are. This video was posted in the Commercial Crew Vehicles General section, but I thinks its worth posting here as it explains NASA's reason for the switch of the heat shield design. The decision was made to switch from gunned honeycomb to blocks, similar to the SpaceX heatshield, but using Avcoat instead of PICA-X. 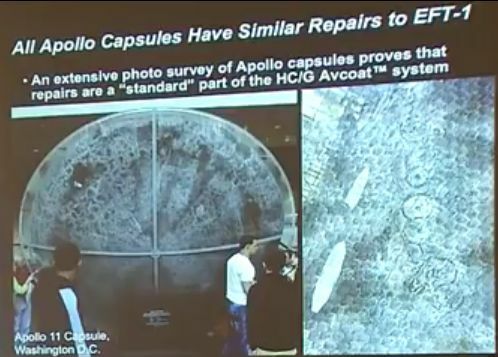 The problem is that the Apollo heatshield suffers from cracks, which the EFT-1 heatshield also had. NASA fixed the cracks by drilling the cracks out and refilling them. The Apollo heat shield could also crack under stress during flight. Apollo analysis and tests showed that these cracks would not compromise the heat shield. There was also the question mark of whether the witness tests represented the strength of the heat shield. By going to blocks, cracks are much less prone to happening and the witness tests would be more accurate, but if there is a crack or the block debonds that is a catastrophic failure. The other advantage is that making the blocks and the shield can be done in parallel instead of in series as with plugged honeycomb. A disadvantage is ensuring the material used to fill the gaps between the blocks (a vulcanising material) should ablate at the same rate as the Avcoat. So, production of the first shield for EFT-1 takes a long time, but the shields after that are produced twice as fast. This seems to me to be a much faster and much more economic solution, since it avoids the very large development costs of a new shield and all its associated tooling. Looking at the risk chart, NASA gives the same orange or high risk for both shields, so there is no increase in safety. Apollo had a greater risk of cracks, but the consequence was much less. Blocks have a much lower risk of cracks, but the consequence is catastrophic. Well, for one, though I can't speak to PicaX, Pica tends not to like getting hit by MMOD. Avcoat does much better. There should be plenty of flight data on PicaX in the toughest MMOD environment, LEO. MMOD resistance was not the main driver for selecting Avcoat over Pica. Search started in 2006... 3 year study for $150M. Changed direction due to cracking, which they had also seen during study. Going to do blocks now, still using AVCOAT, which wasn't studied in block form. In the mean time, PicaX was developed. Flown a dozen times without problems. I ask again, why not use PicaX? Your link notwithstanding (note that it says nothing about MMOD other than that testing was performed), this statement is not really all that accurate. It was a driver in the downselect. I have some direct knowledge in this field. What letter in the word "main" did you not parse? When I state that something was "not a main driver" it means that it was a driver, just not one of the main (as in: biggest) drivers. The link I provided does a nice job of summing-up what down-select evaluation metrics were used. And guess what: MMOD resistance is not even in that list. Your snottiness aside, I'm simply saying that document doesn't tell the whole story. MMOD resistance is not even in that list. Sure it is. It's just hiding in the subparts of #7) Reliability. Good evidence for why it wasn't considered a main evaluation criterion. But, that doesn't mean it mightn't have been one of the main deciding points over which the systems were distinguished from each other if they were otherwise relatively evenly scored. Not sure if this is the best thread, suggestions welcome! About to start 2 days of Net Habitable Volume testing for Orion. Basically, do we have enough room to do stuff with our current cabin config & stowage arrangements. This afternoon, I'm leading a half-day review of the @NASA_Orion fire response concept of operations to determine if the planned design sufficiently supports Orion crew fighting & recovering from a fire. While our engineering teams have designed everything to preclude the possibility of a fire through materials selection, atmosphere composition, power system safing, etc., we could never reduce the chance of a fire to 0.0%. Much of the fire-fighting or protection equipment is going through design reviews now. The goal today is to see how all the individual component designs mesh together into an integrated con ops or to find gaps in the design and assess the associated risk. Very important for us to understand where we are with these potentially life-saving capabilities as we try to finalize(-ish) the Orion design in the fall.